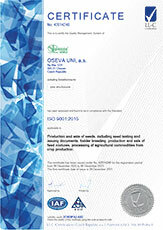 OSEVA UNI, a.s. is the biggest Czech seed and breeding company. Our business activities covering whole territory of the Czech Republic are basees on five branches, large selling network and on three filial companies. Main effort of all our employees is to supply all requierements of our inland and foreign customers in the as much as highest degree. Plant breeding programme of OSEVA UNI, a.s. is focused on breeding of forage and amenity grasses and on breeding of clover species especially on Red clover. .
For further details please contact us on our above mentioned address. > Seed offer for spring season 2019. > Seed offer for autum season 2018. All working actions in our company have operated according to quality assurance standards ISO 9001:2015 since November 2002. By this fact very important precondition has been based to improve quality of our products. Our certified Quality Managent System gives guarantee of maximal control of whole production process and personal responsibility of all employees participating in this process. Next purpose of the Quality Managent System is to look for and to check all demands of our customers in detail to ensure their satisfaction and to fulfil their expectation. Management System ISO 22000:2005 (HACCP) has been certified too. Classification society LL-C (Certification) assessed audits of both systems very positively and without any non-conformances. Our company is accredited according to norm ISO 50001:2011 (energy management) since year 2019. The norm has been implemented into present integrated quality management system.